I have one that fits onto the tow bar and takes up to 4 bikes which I'm happy with. I have a tow bar anyway for a trailer and I find it better as it keeps the bikes away from the car paintwork and seems more robust that hanging it off the boot lid. Any easier to take on or off compared with roof bars. It was the only one I could reliably attach to my Mk2.5 with Zetec S / ST Spoiler. Genius device if you ask me, id still be using it today on my Mondeo mk4 were it not for the tailgate being made of plastic (skin) that would possibly rip off the car when mounted correctly. It has what on first look appears to be quite a lot of play in the bikes when going over bumps but ive drived hundreds of miles around Scotland with two bikes attached and no weakening or slacking of the straps. 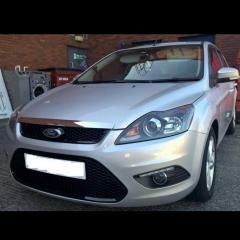 Incidentally, ive had it fitted on Older Mondeos, Fiestas and Nissan Jukes (not mine!!) etc. its really versatile. and due to the design can usually clear any spoilers. If you pre rig the top and left side straps you can fit the carrier in about 2-3 min. bike on in 30 seconds.